What if something as simple as an old plastic bottle filled with water could mean the difference between light and darkness? 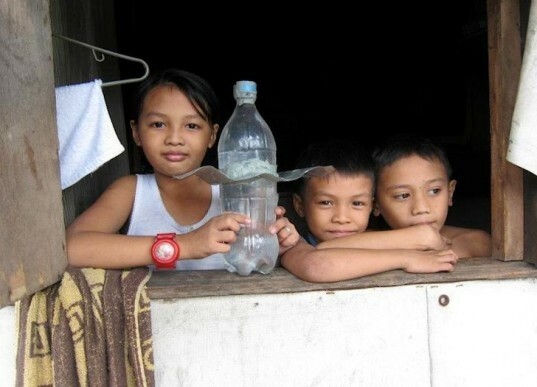 Rudimentary as it may sound, the almost no-cost solution is uplifting the quality of life of thousands of impoverished families in the Philippines who have no access to electricity and use dangerous kerosene lamps indoors. These makeshift solar lamps basically act as skylights, and reflect and amplify the rays of the sun during daylight hours – effectively performing the work of indoor lightbulbs – but without using any electricity at all. The organization behind the installation of the bottle lights, Isang Litrong Liwanag or 1 Liter of Light, was started by Filipino student Illac Diaz just a few years ago but their cause has inspired so many that now they’ve committed to a goal of placing 1,000,000 bottle lights in Filipino households. Read on to see how 1 Liter of Light has energized the people of its country to participate in lighting the way for their own future through this fascinating initiative. While it may seem unfathomable to those of us who take having a readily available light source for granted, millions of Filipinos in impoverished villages and slums go about their daily lives without any kind of indoor light at all. And many of those lucky enough to be able to access the electrical grid run the risk of fire-related incidents involving faulty electrical connections (according to the country’s Bureau of Fire Protection). Not having indoor lighting often means not being able to work or study effectively – which limits productivity and a chance to better your life. Taking this widespread problem as a challenge, 1 Liter of Light has begun installing its recycled solar lights and upgrading people’s lives, one home at a time. The initiative, part of the My Shelter Foundation group spearheaded by Illac Diaz, has already mobilized its army of volunteers, students and homeowners to install 10,000 of these incredibly basic but ridiculously powerful solar lamps throughout Manila. So how do the lights work? Using an idea originally conceived by Alfredo Moser, a band of resourceful students from MIT working with My Shelter Foundation found that they could mimic a light bulb by filling recycled one liter plastic bottles with just two common substances – water and bleach. 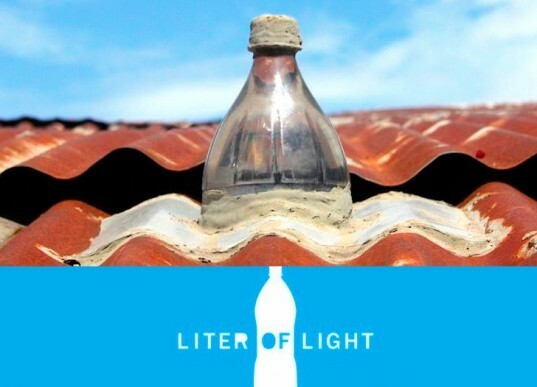 The lamps can then be installed into a home’s roof in just an hour by cutting a small hole, plugging the bottles in and then sealing it off. The students found that despite not being connected to any type of electricity, the plastic and water can defract natural light and push it to every corner of a small house. Just one liter of the water and bleach mixture in a plastic bottle can give off the same amount of light as a standard incandescent 60 watt light bulb! The bleach keeps the water free of germs and one solar lamp can keeping working for as long as five years. If the idea that person’s life can be made drastically better through an object that is so affordable and easy to make inspires you, you’re not the only one. 1 Liter of Light has ignited the passion of volunteers and sponsors from all around the world as well as Filipinos in the communities where the solar bulbs are being installed. It seems everyone from the city’s smallest children to even the local penitentiary’s inmates are getting involved and helping produce recycled bottle lights! And even though they’ve touched and brightened the lives of so many already, Isang Litrong Liwanag has no intention of stopping. They’re aiming to install their solar lamps in one million homes in the Philippines and around the world by the end 2012. If the story of 1 Liter of Light has sparked your desire to make a difference, see how you can donate or volunteer with them here, and help them meet their aim of lighting up four million homes on four continents by the end of 2013. So, same effect as having a window right? I guess a water bottle is cheaper than glass, so it kind of makes sense. But saying that it replaces electrical light bulbs is quite confusing. It sounds like they will work on nighttime as well, which I find hardly possible. Destroyed roof, problems with leaky sealing, that happens even when good quality building materials is used. soon water will enter the house. Dirt can collect on the outside of the bottle, and algea inside the bottle. Opening up the spaces would also increase the amount of heat entering the structure from the sun, as well as exposing the structure to wind and rain during storms. This solution provides light within the structure without exposing the structure. And yes, it does only work during the day, but if someone lives in a structure that is dark all day and all night, they would be so thankful to have light, even temporarily, during the day. This is a brilliant, simple, cost effective solution for a problem that most of us have never considered. a truly inspirational project that would benefit our societies and the world. Sparking Idea. In India, there is a river known as Ganga,the best part about Ganga is that it water remain germ free even after 5 or 6 years without treating with any chemicals. So what I mean is that here we can use this water without need of Bleaching powder. You mean to tell me this does not work at night and only works during the day? Then a battery will be needed to store the energy? Waht's the point? Sounds costly to me. That doesn't make sense specially if these are for poor people. The spaces of the houses of those poor people are dark because they didn't put "openings" in them to allow daylight to come in. They enclosed it with concrete blocks and corrugated metal. It's all too easy to get carried away with "bright" objects such as these, but we need to step back and think about what the real problem here is. The real problem is poorly designed spaces for poor people. This can be solved by simply opening up the spaces, providing openings in those hollow block walls and let daylight into those spaces. This bottle solution is simply "green washing" it under the guise of re-using plastic bottles. If you open up the spaces, you get light from the sun during the day, then light from the moon during night. No need for collecting plastic bottles nor batteries. Bleach keeps the algae out. True, the light does not work at night when there is no sun, but they are working on a way to store energy in a battery to counteract that. In the meantime, having light in a dark space during the day is a God send to the people who can't afford electricity! Wouldnt algae build up? Then you would have to replace the water with a pump, as it is permanently fixed in the roof... Am I wrong? So inspiring, so simple. Well done! But this works only while the sun is up. What happens in the night? This is an amazing project that offers a simple solution to a widespread problem! Such a brilliant concept -- I love everything about this project! Very impressive and props to Illac Diaz, who is working on many other positive initiative in the Philippines on top of this one! Such an inspiring idea! Absolutely amazing! What if something as simple as an old plastic bottle filled with water could mean the difference between light and darkness? 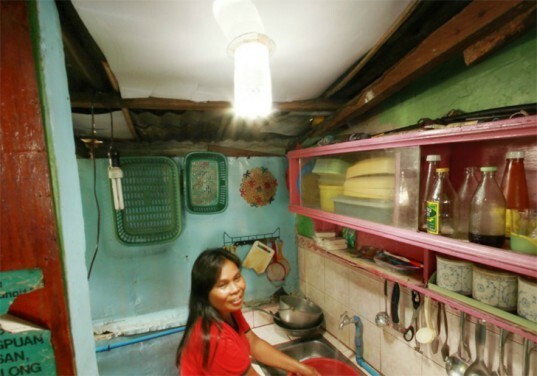 Rudimentary as it may sound, the almost no-cost solution is uplifting the quality of life of thousands of impoverished families in the Philippines who have no access to electricity and use dangerous kerosene lamps indoors. These makeshift solar lamps basically act as skylights, and reflect and amplify the rays of the sun during daylight hours - effectively performing the work of indoor lightbulbs - but without using any electricity at all. The organization behind the installation of the bottle lights, Isang Litrong Liwanag or 1 Liter of Light, was started by Filipino student Illac Diaz just a few years ago but their cause has inspired so many that now they've committed to a goal of placing 1,000,000 bottle lights in Filipino households. Read on to see how 1 Liter of Light has energized the people of its country to participate in lighting the way for their own future through this fascinating initiative.